The Isys? TPS-6 Tilt Touchpanel delivers high-end style and performance in a striking tabletop design. Sleek and compact, the TPS-6 does away with piles of remotes and cryptic control panels, affording true "one-touch" control over a broad range of complex devices and systems. Featuring a bright, beautiful, high-contrast color touchscreen, and a smart array of backlit tactile pushbuttons, the TPS-6 offers an ideal user-interface for controlling multimedia presentations, home automation, and a host of other uses. The TPS-6 provides a wide open canvas for the creation of custom control screens tailored to each unique application. Its brilliant 5.7" active-matrix display and powerful Isys engine combine to produce stunning 16-bit color graphics with extreme versatility and lightning-fast performance. Dynamic graphics and text capability enable the display of all kinds of useful data and alluring eye candy?from audio settings, TV channels, and lighting levels?to changing icons, photos, and logos?to digital media playlists complete with album cover art. Crestron exclusive DNav and Synapse? technologies enable system programmers to produce amazing graphics faster and easier using advanced dynamic control menus and 3D effects. Additional capabilities like animations, multimode objects, PNG translucency, and full-motion video enhance the palette for creating GUIs that are both eye-catching and easy to use. In addition to its touchscreen, the TPS-6 features illuminated tactile pushbuttons for quick access to volume adjustment, channel selection, and on-screen menu navigation functions. Eight additional pushbuttons, elegantly trimmed by illuminated button dividers, flank the edges of the touchscreen to support additional programmable functions. High-quality backlit laser-engraving lends a crisp, legible appearance to button text in both darkened and fully lit rooms. The pushbuttons come pre-engraved with labeling suited to a typical home theater or multimedia presentation application. 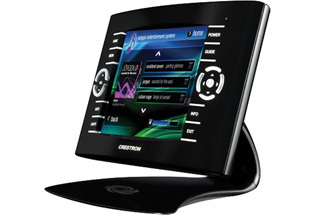 If needed, customized engraving can be attained simply using Crestron Engraver software. A no-button front bezel is also included with the TPS-6, which may be installed in place of the button bezel for a very clean appearance with no front panel pushbuttons. Two additional "trigger" style buttons are positioned on top of the TPS-6 for easy control of the display brightness and other programmable functions. The TPS-6 displays full-motion video, providing the ability to monitor a security camera, or preview a DVD or television channel, right on the touchscreen display. The video image is fully scalable for viewing in any sized window or full screen. The choice of balanced or unbalanced composite inputs allows compatibility with both conventional coaxial and Crestron Home? Balanced AV distribution systems.